Who has the power of veto? MRG Systems engaged a Certified Practitioner to undertake a full Touchpoint Leak™ Assessment to set priorities, and then ongoing consulting engagements to roll out the tweaks to their marketing leaks. When you talk about marketing, everyone has an opinion about how things should be done. But opinions can be based on hunches, which can turn out to be costly. We wanted to be taken through a proven marketing process – and it’s already had a big impact.” Darren Macdonald, Head of Sales, MRG Systems. MRG Systems are experts in designing, supplying and running digital displays. You’ll find their systems in places as diverse as leading UK retail betting shops, schools & colleges, and the Houses of Parliament. Like many smaller businesses, there isn’t a marketing department. So, marketing responsibilities fall under the Head of Sales, Darren Macdonald. 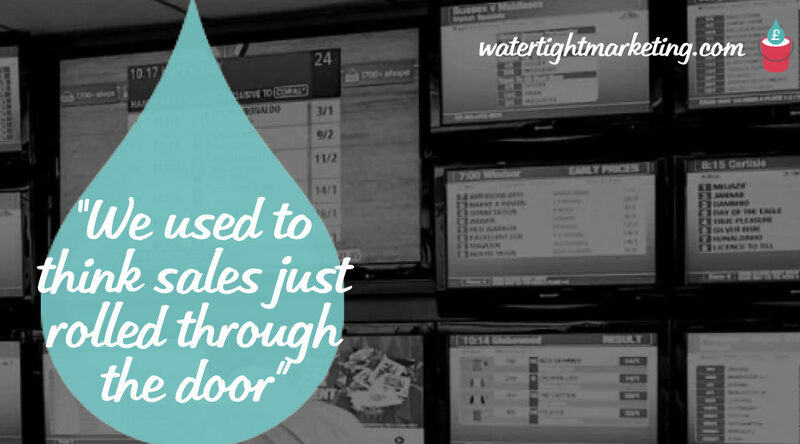 MRG Systems wanted to ensure they were addressing the right marketing priorities for their core market of retail betting, and raise the marketing capabilities across the business in readiness for growth into new markets. MRG Systems had no prior knowledge of Watertight Marketing, but had known Certified Practitioner, Joshua Morse, for a few years. Having listened to Darren describe their needs, Joshua suggested they review their marketing using a Touchpoint Leak Assessment. Developed by Bryony Thomas, drawing on more than a decade’s experience and across over 200 businesses, the Touchpoint Leak™ Assessment is a bottom-up analysis that identifies how businesses lose both customers (and the potential profit they could bring) from their marketing activities. This builds a powerful traffic light action plan of priorities. It looks at customers, potential customers, and third parties that influence the buying decision. Related post: What are the Thirteen Touchpoint Leaks? So, what more did MRG Systems discover – and what actions did they take? Apart from not talking to the real buyer, MRG Systems had an additional problem. When the IT people put forward their solution internally, the marketing department would often veto the proposal. And, as there was no relationship between MRG and the marketing team – that was often the end of it. This is what we call ‘No critical approval’ – or, the dreaded ‘power of veto’. Before spending a lot of money a buyer will often consult a key third party. If that person says no to the purchase it will rarely proceed – as MRG Systems realised. In continuing to talk to IT, MRG Systems found themselves selling to people that didn’t have the ultimate sign-off. This was a deal breaker, and a major profit leak. With a considered purchase like digital signage, buyers will often consult others, they’ll ask their network and they’ll want to hear about people they feel they can trust. And, in any purchase decision the existence of proof can really help a sale. Case studies and testimonials are a great example of demonstrating proof. But, MRG Systems had a classic problem – they’ve always proven hard to get. Related post: What is a considered purchase? There have been two reasons for this – both of which have now had a successful ‘work around’, thanks to the Touchpoint Leak™ Assessment. The new approach is two-fold. The realisation that the marketing team is the key user means they now ask them for feedback. MRG Systems have demonstrated that some of the immediately impactful marketing tweaks are easy to overlook – because the business is often too close to the problem – they can’t see it. Darren readily admits that knowing who your real customer is might sound like an obvious starting point – but it took being asked the right questions to bring it out. The Touchpoint Leak™ Assessment has looked at each of the thirteen profit leaks. To date MRG Systems have only addressed the most urgent. There’s a great deal more in the recommendations produced by Joshua – far more than can be featured in this case study. Reflecting on the process, Darren is looking forward to implementing additional Watertight Marketing recommendations, and to working further with Joshua.